You might see this photo, and thought about it whether real or fake. 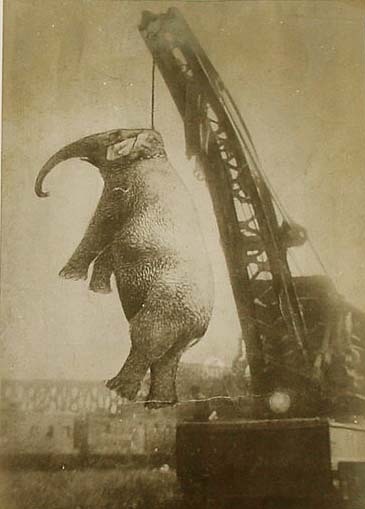 Nevertheless, the old picture is strange enough, you can see hanging of an elephant. What is the story of it? Was it a real execution and what was the sin of this luckless animal? The story of Murderous Mary was really sorrowful likes a ballad about the miserable life of a circus elephant and the bloodthirsty crowd which didn’t mercy on her. What is the truth about this story? In the medieval ages it was not rare that animals were sentenced to death in courts. However, in the modern ages it was not part of the legal system, but in this case the public hysteria and economic consideration led to this bloody revenge and brutal attraction. Many zoo professionals often prefer an unemotional approach to animals, which could be acceptable if we only considered animals gene carriers, genes we should save and preserve for the future. This approach is an important condition of population-level conservation work, but… we also have to consider the emotional aspects in the case of zoos. Here many animals have a name, are loved and followed individually by visitors. Even zoos force this kind of impersonation, which could help with the propaganda, education work and increase the income. It is not a new phenomenon, there have been Knut-like favourites in the early era of modern zoos too. Some zoo heroes even entered literature, as did the world’s most famous bear cub: Winnie-the-Pooh. Let’s see, who was Winnie originally! I am usually amazed by how some visitors dress for visiting a zoo. Have you ever seen the provincial family in their Sunday best? Or have you met the elegant lady staggering as a new-born camel in high-heeled shoes on the dirty pathway? Or the guy sweating in survival equipment in a tropical house in the middle of a city? Experienced visitors, on the other hand, choose the most appropriate clothes for visiting a zoo, of course. But how do zoo workers dress? Do they wear convenient and practical clothes, or should they accept other aspects as well? Zoo employees are an important part of the whole design like in any other branch of entertainment. The visitors expect to see the workers as the representatives of this strange and fabulous world. In other words, a lot of visitors regard zoo workers as living in a dream world; so their appearance should reflect this expectation. It is also important that visitors can identify insiders quickly; zoo managers should facilitate this too, leading to uniforms. Although zoos are usually regarded as modern Noah’s Arks, they can turn into battered dinghies in disasters – like any other achievement of our civilization. Moreover, the inhabitants of zoos are more vulnerable since the systems designed to prevent escape often reduce their chance of survival. The fates of escaping big animals are not too promising either; they are usually hunted down in order to protect people. Giraffes are among the most popular animals kept in zoos. However, while a giraffe is ’only’ a giraffe for most of the visitors, it is also an important genetic resource for the survival of the species in the eyes of the staff of zoos and other conservation organisations, who are working to preserve genetically pure giraffe subspecies. The giraffe (Giraffa camelopardalis) inhabits a lot of savannah areas in Sub-Saharan Africa, but these areas are fragmented and isolated from each other. Nine subspecies are living in these separated areas. Due to the geographical isolation pattern, differences have developed in these subspecies.